Esri’s Story Map is a terrific resource for for sharing a narrative, media and an interactive map, all on one screen. Green Map Makers that want to create a media-rich map that's shared online will like this option. 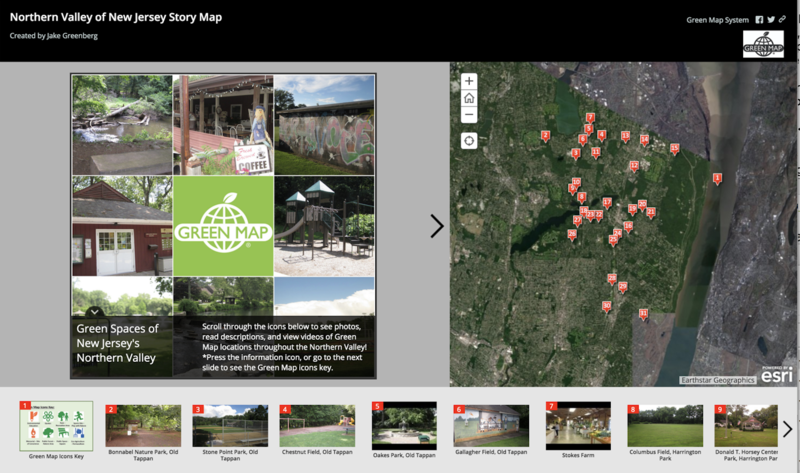 Here, you can see a variety of nonprofit Story Maps - they will help you consider whether this platform is best for your Green Map. Users can 'tour' by clicking the map, media or the narrative. Explored online, it can be shared as a link or as a responsive embedded map. You can import CSVs (from Open Green Map or another source) and add new sites. Lots of customization is possible, but you’ll definitely need some ArcGIS skills. This is a great platform for people with intermediate GIS skills who want to extend their map into a story about community progress toward sustainability, and promote nature, culture, social and green living sites! Create this Green Map on the internet, generally regardless of browser or operating system. To share it, you’ll need to upload the resulting files on your own server (or we can place it on GreenMap.org’s server), then share the link or embed with an i-frame. It works on phones and devices as it’s responsive, and changes shape as it loads. The Northern Valley is a Story Map featuring a suburb region northwest of Manhattan in New Jersey. It was created by Jake Greenberg as part of his 2017 summer internship at Green Map. Click this image to access the interactive map. Thanks to the donated services of Esri Canada, we have a detailed tutorial for using the Story Map platform, improving some of its visuals, and outfitting it with Green Map Icons. Our thanks to Brent Hall and Jonathan Van Dusen at Esri Canada, Jake Greenberg and Lucas Reckhaus. Download this PDF to get started. You can also share ideas below. If you have detailed questions or want to interact with others working on similar projects, you can reach out to the Esri Community on the Geonet Discussions Lobby.